Romania, the land of castles, Dracula and walled cities. We were excited what this new country would bring for us. We had heard many good travel stories and the mountain magic of the Transfăgărășan was calling us. Time demanded for us to take a shortcut so instead of visiting the capital Bucharest we cycled north from crossing the border at Giurgui. We hadn’t had as many flat kilometres for ages as we had the first kilometres. A storm was approaching though so we pushed the pedals and tried to outride it. We cycled through the lovely towns of Pitești and Curtea de Arges, seeing signs to Râmnicu Vâlcea aka Hackerville, a town in Romania full of hackers. We are on the DN7C and slowly the rise to the Transfăgărășan begins. We camped in a field where we get the delightful company of a herd of sheep. The farmers look a bit rough and when they come up to us we try to make some conversation but they are not so interested. Soon they wander off in the distance and we have a quiet night’s sleep. In the morning there is a great sunrise and again we are together with the sheep. Coming from the south we know it is going to be a steady climb. It starts relatively mild and we enjoy cycling through green forest. We notice there are more and more cars and motorbikes on the road but still we have enough quiet time to be in the present moment. Once we reach the dammed lake we find the first tourist stop with overpriced water. We decide to buy it anyway and cycle off while clouds are looming in the distance. We chose the main road instead of the small road on the other side of the tunnel because we preferred to make faster distance on the asphalt. Soon we need to start looking for a place to sleep for the night. All along the lake on the asphalted road there is not much space along the road. We find a small road to the side and ride it for 2 kilometres but no camping options present themselves. Finally we find a small spot just off the main road in-between trees. It is a bit moist but we are happy to find a place which is flat enough to sleep. We cook and sleep early because the real climb is waiting for us tomorrow. We have an early start but already cars, motorbikes and speed cyclists are on the road. The sky is clear and we enjoy cycling up and up. We are still following the small river and the road takes us through small half closed tunnels towards the switchbacks. Traffic and tourists are increasing but it is a great day and we are happy. Slowly clouds are coming in and the fog makes everything less visible. It starts to rain so we switch to our rain clothes. We enjoy looking back down at the valley where we came from. The road has a few switchbacks and the valley just looks amazing. Actually the climb is not too steep so we make it easily to the top. The tunnel is dark and when we get to the other side we are wowed again. This time not because of its beauty but because of the amount of tourists and facilities on the top of the mountain pass. It is definitely a stop on the tourist route. We have a short lunch break and soon we notice clouds are coming in so we need to hurry up before it starts to rain again. The moment we set off the clouds are surrounding us at the top so we can’t see the amazing switchbacks on the north side the Transfăgărășan is famous for. After a cold start the sky is clear and gradually we can see more and more. It has rained on the mountain so we need to be careful on the way down, we don’t want to slip. About halfway down there is an amazing view of the valley below. It is very clear that the mountains just rise from the plains. It is a very special view. We speed down keeping an eye on the road and the clouds and we get another splash of rain. Shivers run along our spine but soon the temperature starts to rise and we can feel we are approaching lower altitudes. Before we know it we are back on the plain and it is steaming hot again. We stop at a petrol station and reminisce about the mountain. It is our last real mountain pass of the journey. We will definitely miss the feeling of climbing up mountains. Letting the road rule our pace and enjoying the views that only mountains can bring. Although it is still 50 kilometres we decide to push to Sibiu and see if we can spend the night there. Sibiu surprises us on two points. 1) it is a really nice city and 2) accommodation is expensive and almost everything is full because of summer and a festival going on. After such a long day on the mountain we were hoping to check into a hostel. After searching the city for hours and hours we ended up in an overpriced guest house. It looked a bit dubious but our options were limited at that point. We did already have a nice time sightseeing the city which was old and quite beautiful. We didn’t know a lot of what the rest of Romania would bring and we were surprised. 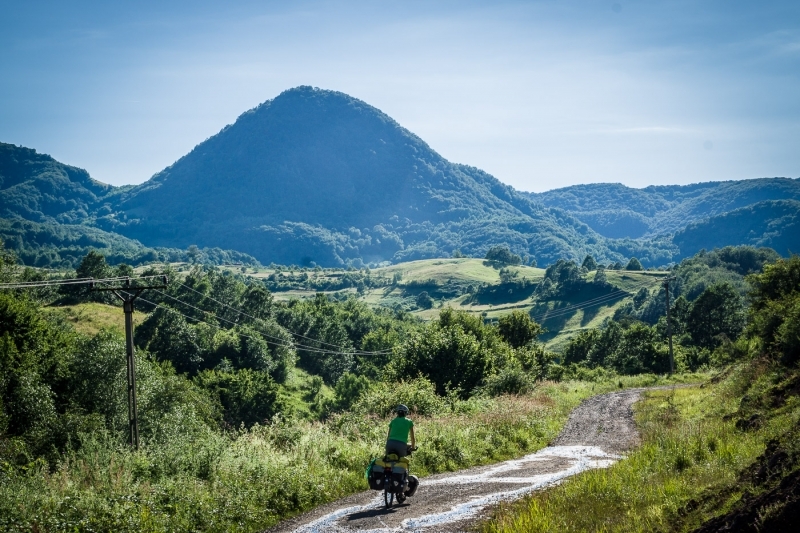 It was a mix of old soviet towns such as Zlatan and Brad where we could see the remains of old factories and industry, combined with beautiful natural hills and forest on the edge of Apuseni national park. We even were surprised by the existence of a small museum. We weren’t sure what to expect and were welcomed in by the enthusiastic host of the small museum. And before we knew it we were amazed by the amount of artefacts he had collected and things he had built up in this small museum. Our last night in Romania we had an interesting surprise. We had made our camp at the edge of a field and were out of sight from everything. After cooking it was getting time to sleep. We were both dozing off for a great night’s sleep and dreams were in our head. At exactly the same time we sat up straight because we had been awakened by a loud noise. It was 11 o’clock in the evening and a farmer had decided that this was the best time to cut his field with a huge machine. Luckily it only took half an hour and he waved friendly at us while we just peeked out from our tent. It was a restless start to the night.